Objects in mirror are closer than they appear, because they are passing you! If you're reading this site there's a good chance you've gone to or wanted to go to a race driving school. I can do that; mom says you can do anything you put your mind to. Skip Barber runs the best program around, heck they put guys like Montoya and Gordon on track, so it's like getting my foot in the door! 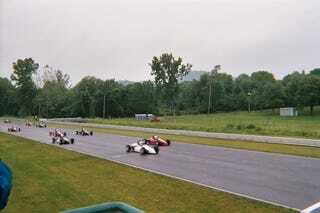 So one fateful week in 2003 I finally got the money up to try it, and I drove myself up to Limerock, CT thinking I was the next Senna, too bad little did I know the next Mazzacane drove there. Day one I rolled into the classroom with my mind ready for action. I met Bruce MacInnes who is one of their lead instructors. He sat us down and discussed a lot of basic race craft with us. Asked us some racing trivia too, which of course I knew every answer. Sam Posey happened to be there which was great, I got to talk to him for a few minutes, really nice guy and I really felt like I was prepared to start. Then, we got in the cars. "Put it in first gear and just roll out there slow" they said as they lined us up by the short course they had set up for us to get a feel for the cars. So here I am, I'm ready to race, ready to take my first big step and, THUD stalled it. "Don't you know how to drive stick?" Bruce asks, "Yeah of course I do I..." THUD. This dance continued for another 5 minutes till I finally got it in gear and took off to start my racing adventure. Sure I was rolling around an autocross course in 1st and 2nd gear at half throttle trying to keep from stalling it, but I felt fast. Needless to say the day continued with more classroom training and more in car exercises many of which involved me stalling the race car because honestly I had barely driven stick more than a few times in my life. But I couldn't tell them that. No, the clutch must be sticking; yeah that's a manly answer. Except the person I was sharing the car with, a 90 pound girl I might add, had no problem whatsoever. Day two comes along and now we are getting full laps around the track. Bruce is also taking us on rides around the track in these full size Dodge vans. I think: how crazy could it be, we are in a van. Holy sweet mother of Jesus was I wrong, and as I was bouncing from seat to face planting the side window I started to have some thoughts "Have I paid up my life insurance? This glass is cold. Do I have a will? Do I really want to keep doing this crazy stuff?" I shook them off, held on for dear life and said a few hail marys so that we would all survive. I start to evaluate myself versus my classmates and I listen to the feedback they got as well. My favorite was "Wow you look really smooth out there sometimes, you should come back and race with us, if you learn to brake a bit earlier so you don't turn into a greasy spot on the guardrail you may turn into a pretty good race car driver!" I was glad that wasn't me. So the morning of day three the news says that it's going to rain. Bruce lauds this opportunity to teach us rain driving, and so we get out on track and they start to space us out and turn us loose. I get going and there I am, tearing down the main straight, big rooster tail, stand on the brakes and turn into the first turn. Great I'm holding it and I unwind for the lefthander but while I was unwinding, the car was not cooperating. A mere moment later was the point that I learned the tire barriers are not as mushy as they seem on TV. Bruce was immediately on scene, and it turned out I didn't break anything! Lucky me, we pull the car off the tires, and I head to the pits for a talking to. We discuss what I did, how I did it and so forth. And then they get me right back into the car with me promising to remember "smooth is fast, follow the outside of the track, roll into the throttle, and roll into the brakes". Off I go, I get through the first turn, then the left hander, great I'm still alive, and then I get to the right before the back straight. Now anyone who knows Limerock knows that last right is a bit tricky. Well, apparently this was my lesson in how tricky because at this point the car kept turning right and sliding again. Many four letter words emerged from my mouth as I saw the mound of dirt I was headed for. I frantically tried to remember my training and my promise. And I did what I remembered, I started to regain control, I had the car turning back, I was straightening out, I am a hero, I am…. At that moment the rear end snapped around the opposite direction and put me right into the guardrail, hard. Sitting there I contemplated what went so wrong as my classmates drove by, probably wondering the same thing. A wrecker shows up for the car, this time it's done for. They took me back to the pits and surprisingly after a discussion they had me right back out on track (probably with fingers crossed), and even better at that point the rain stopped and it dried up. Back out there and I was really going swimmingly, I picked up my pace, and then I increased it. I was passing people, I was on a high, I beat the odds, I came back from the edge, and I can really do this. Then, on the front straight, I got passed and dropped like I was an old lady blocking the left lane on the freeway. But I had the biggest grin on my face in the world, and I knew this was the best choice I've ever made.